Just a quick update: We do continue to see an increasing trend in login attempts to our honeypot using the backdoor password. If anybody has a vulnerable device to "donate", I would like to send some of that traffic to it (need it to be accessible in an isolated network. Do not need it shipped :) ). 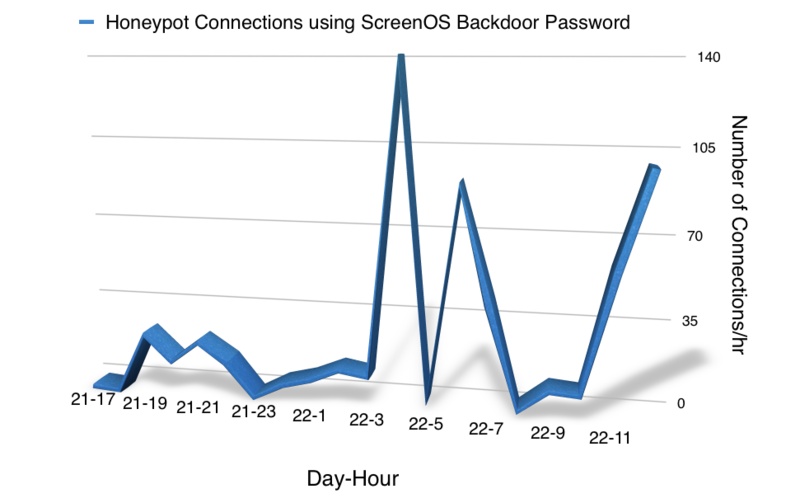 We are detecting numerous login attempts against our ssh honeypots using the ScreenOS backdoor password. Our honeypot doesn't emulate ScreenOS beyond the login banner, so we do not know what the attackers are up to, but some of the attacks appear to be "manual" in that we do see the attacker trying different commands. We saw the first attempt at 17:43:43 UTC about an hour after I adjusted the kippo honeypot to return the Netscreen banner. How you go about changing Kippo banner? Aren't the Juniper backdoor accounts 'Username1' and 'Username2' ? I don't see any attempts against those accounts in your post.